here's my green strings. what fun! Love it...Love it...Love it...don't know if you intended it to take on the 3-dimensional look, WOW! Oh, how fabulous! 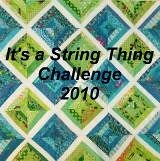 If I didn't know a thing or two about string quilts, I would have thought it took you a lifetime to make such a treasure!